The VivaLift! Elegance v.2 infinite position life chair offers the latest in ergonomic comfort and performance in a timeless design that will look great in any home. This spacious chair comes with a pillow back design and fully powered components that allow you to individually adjust headrest, seat back, lumbar support, footrest and recline angle for individualized comfort that fits your body. For the ultimate in stress relieving relaxation, you can lay the chair completely flat, which is perfect for sleeping and extended periods of use. 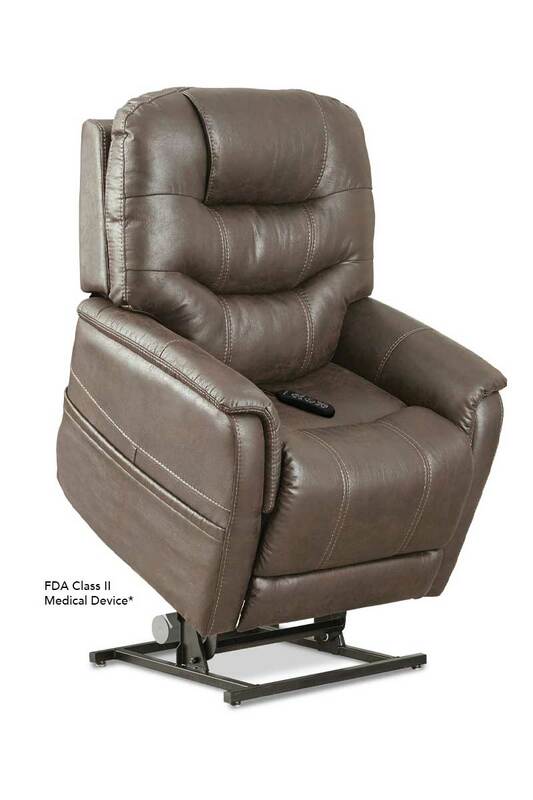 In addition to providing a fully adjustable recliner, this model also offers a powerful and reliable lift mechanism that will allow you to enjoy more freedom and mobility. With the push of a button, you can gently transition between sitting and standing positions. The industry first lithium battery ensures that your chair will continue to operate even if the power goes out. You never have to worry about losing the use of your lift. Customers are also drawn to the VivaLift! Elegance for its stylish design that combines the best in classic and modern design details for a truly elegant chair. This model will make add a touch of sophistication to any home. Call today to learn more today. Distance Required from Wall Reclined: 14"